Nothing beats a home cooked meal, especially if you’re feeling particularly homesick whilst living in a new country. Mastering the art of cooking these dishes and being able to replicate them in your new country can be tricky. Aga, a Polish girl “by birth, heart and stomach” lives abroad in France, and while she loves French food, she still cooks Polish dishes at home from time to time. Here are her top ten Polish dishes to cook when living abroad! Kotlet Schabowy: these are boneless center-cut pork chops or tenderloin steaks, which I pound gently, coat them in egg and breadcrumbs and then fry in a pan. They taste better with potatoes or dumplings with gravy and accompanied by beetroots or sauerkraut salad. Kluski Slaskie: traditional Sunday lunch in Poland would not be complete without dumplings! These Silesian dumplings are made from mashed potato, a special Polish potato flour, and eggs. Roll them into small balls with a small hole (for the gravy) and boil them for a few minutes. The traditional way of eating them is to serve them with the gravy, Polish rolada / Schabowy and red cabbage. Kotlet Mielony: To make these intriguing little burgers, you’ll need to mix the minced meat with some onion and egg and a wet, softened roll. Then add spices to your taste and roll the steaks, covering them in breadcrumbs. When you’re ready you can fry them in a pan. Typically, kotlet mielony should be served with a burger roll, potatoes and cabbage. 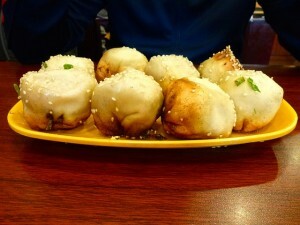 Knedle: Yes you guessed it, more dumplings! Knedles are actually made from potatoes which gives them a different consistency. You need to mash the potatoes and combine them with potato flour. Then make round balls and fill them with plums. These sweet dumplings are served as a main meal. 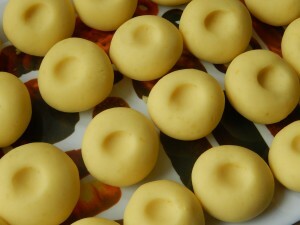 Try serving them hot and add plenty of melted butter and sugar sprinkled on the top for those with a sweet tooth. Pierogi: These little dumplings are the pride and joy of Poland and they are often accompanied by different stuffing options and can be either sweet or sour. 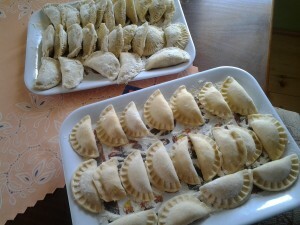 The traditional sour pierogi are filled with sauerkraut, mushrooms, cheese, potatoes and meat. The sweet pierogi are stuffed with white cottage filling and a range of fruits, most commonly strawberries and blueberries. Although they are quite time-consuming to make, I have fond memories of my helping my mum make a huge batch for the family. Nowadays however, we tend to buy ready-made ones. In France, I have to make them from scratch once again, but at it brings back good memories! Gołąbki: The Poles do love a hearty cabbage meal, that’s for sure. This time, the cabbage leaves are used to wrap a mixture of minced pork, rice, onion and mushrooms. Once all the cabbage leaf parcels have been made, they can be be boiled in a big pot along with a tomato sauce. You’ll need to cook the parcels until the leaves are soft. 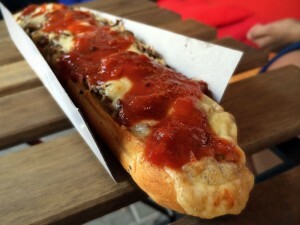 Zapiekanka: This popular Polish fast food dish consists of a grilled half baguette with a very interesting topping: fried mushrooms, cheese and pickled cucumber. You can add ham and a variety of spices, but the main ingredients should be the mushrooms and melted cheese. Eat it hot and crunchy and with ketchup! Rosół: This is a simple noodle soup that is served during a Sunday lunch (if you can squeeze it in with all the dumplings that is!) My dad loves to make this dish. When I was younger, I was never a big fan but since living abroad I crave it all the time. Fortunately it’s not difficult to make, all you need is chicken, a selection of vegetables and some spices. Keep trying your soup until you are happy with the blend of spices. It is also doubles up as a great remedy when you are sick because it’s full of energy. 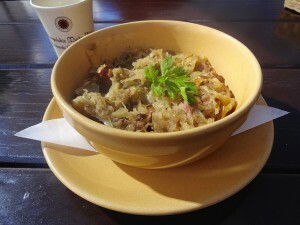 Bigos: One for the meat lovers – this hearty stew consists of sauerkraut, cabbage and smoked porks such as sausages and bacon. This is my Dad’s specialty; the trick is to make it when you have a random selection of leftover meat in the fridge. All you need to add are the mushrooms and tomatoes (fresh or paste) to achieve that warm orange colour in the stew. Kopytka: These are easy, cheap and popular potato dumplings in the Silesia region. They are quick to make and are famous because of they are shaped like a hoof. They are eaten on their one (like gnocchi), but can be accompanied by fried bacon, onions or by a gravy (red, white, mushroom). I have had the pleasure of trying the culinary delights that Lyon has to offer, but I am a Polish girl by birth, heart and stomach. I was born in the Silesian region, which is well known for its good comfort food and very tasty regional specialties. Hungry yet? If you are feeling homesick when living abroad, master the art of cooking your home country’s food…or give these tasty Polish dishes a try! You can read more of Aga’s adventure as an expat in her blog. Next story Woah-tels: beyond bed and comfort? Previous story Where did these historical events take place?